Welcome to our family of Labrador Retrievers..
Labradors are relatively large, with males typically weighing 29-41 kg (65-90 pounds) and females 25–32 kg (55–71 lb). Labs weighing close to or over 100 lbs are considered obese or having a major fault under American Kennel Club standards, although some labs weigh significantly more. The majority of the characteristics of this breed, with the exception of colour, are the result of breeding to produce a working retriever. As with some other breeds, the Conformation (typically "English", "show" or "bench") and the Field (typically "American" or "working") lines differ, although both lines are bred in both countries. 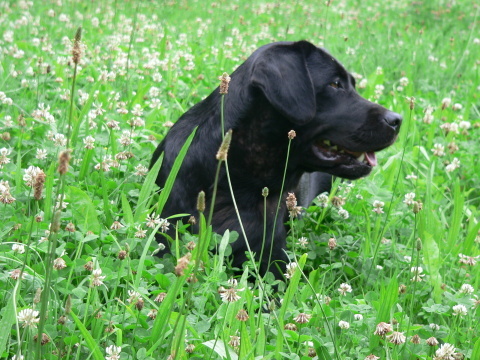 In general, however, Conformation Labs tend to be bred as medium-sized dogs, shorter and stockier with fuller faces and a slightly calmer nature than their Field counterparts, which are often bred as taller, lighter-framed dogs, with slightly less broad faces and a slightly longer nose; however Field labs should still be proportional and fit within AKC standards. With field labs, excessively long noses, thin heads, long legs and lanky frames are not considered standard. These two types are informal and not codified or standardised; no distinction is made by the AKC or other kennel clubs, but the two types come from different breeding lines. Australian stock also exists; though not seen in the west, they are common in Asia. The breed tends to shed hair twice annually, or regularly throughout the year in temperate climates. Some labs shed a lot; however, individual labs vary. 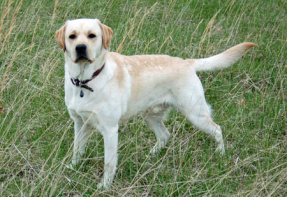 Labrador hair is usually fairly short and straight, and the tail quite broad and strong. The otter-like tail and webbed toes of the Labrador Retriever make them excellent swimmers. 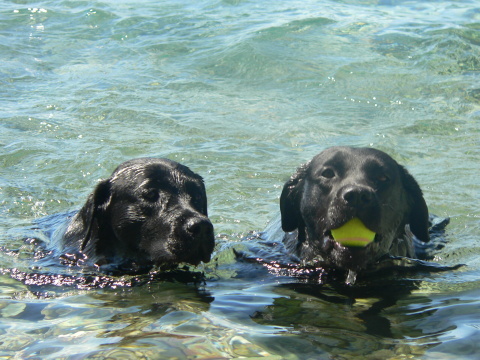 Their interwoven coat is also relatively waterproof, providing more assistance for swimming. Like any animal, there is a great deal of variety among Labs. The following characteristics are typical of the conformation show bred (bench-bred) lines of this breed in the United States, and are based on the AKC standard. Significant differences between US and UK standards are noted. 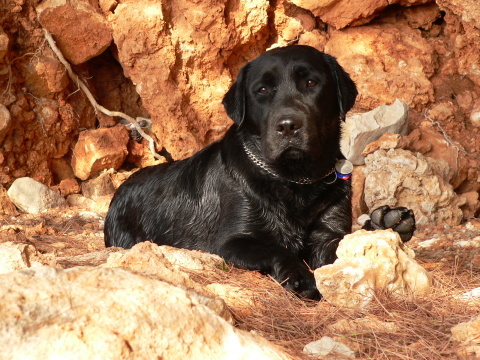 * Size: Labs are a medium-large but compact breed. They should have an appearance of proportionality. They should be as long from the withers to the base of the tail as they are from the floor to the withers. Males should stand 22.5–24.5 inches (57–62 cm) tall at the withers and weigh 65–80 lb (29–36 kg). Females should stand 21.5–23.5 inches (55–60 cm) and weigh 55–70 lb (25–32 kg). By comparison under UK Kennel Club standards, height should be 22–22.5 inches (56–57 cm) for males, and 21.5–22 inches (55–56 cm) for females. * Coat: The Lab's coat should be short and dense, but not wiry. The coat is described as 'water-resistant' or more accurately 'water-repellent' so that the dog does not get cold when taking to water in the winter. That means that the dog naturally has a slightly dry, oily coat. Acceptable colours are black, yellow (ranging fom ivory or creme to fox red), and chocolate. * Head: The head should be broad with a pronounced stop and slightly pronounced brow. The eyes should be kind and expressive. Appropriate eye colours are brown and hazel. The lining around the eyes should be black. The ears should hang close to the head and are set slightly above the eyes. * Jaws: The jaws should be strong and powerful. The muzzle should be of medium length, and should not be too tapered. The jaws should hang slightly and curve gracefully back. * Body: The body should be strong and muscular with a level top line. As well, Labradors should not have droopy eyes (like a Basset Hound). The skin should be relatively tight, and you should not be able to see the pinks on the inside of their lids. 1970: in this year J. Bradley imported three couple of dogs to our country. Next couple of dogs was imported in the year 1975. Those dogs were two year old. 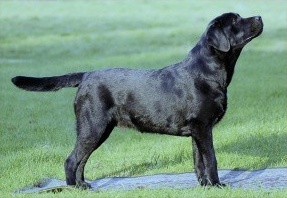 At the moment there was a first breeding station of labradors in Czech Republic called "z Pomoraví".